Drawing Down the Moon is a beautiful Wiccan Ritual that is usually done within a Cast Circle on a Full Moon and preferably under the light of the Moon. The Ritual is traditionally performed by a coven's High Priestess who enters a trance and calls the Goddess to enter her and speak through her. While the Priestess is in trance she speaks and acts as the Goddess. She may recite the Charge of the Goddess or she may speak prophecy and give advise. This Ritual may also be performed by a solitary by standing in the light of the Moon, arms in Goddess position (Y) and chanting or reciting the Charge of the Goddess. Blessed be thy lips that shall utter the Sacred Names. To descend upon the body of this thy servant and Priestess. With loving sacrifice thy shrine adorn. 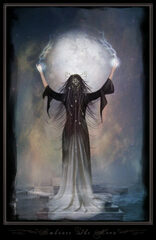 This next section of the Drawing Down Ritual is spoken by the High Priestess invoke the Goddess. A solitary could also use these words to Draw Down the Moon. Here I charge you, in this sign. Who give true worship unto me. In token that ye be really free. Work ye my mysteries in mirth. Mighty Mother of us all. At this point in the Ritual the Goddess has descended into the body of the High Priestess. Everything said or done from this point on is considered to come directly from the Goddess Herself. In many traditions the High Priestess recites the Charge of the Goddess, or she may simply speak using her own words.